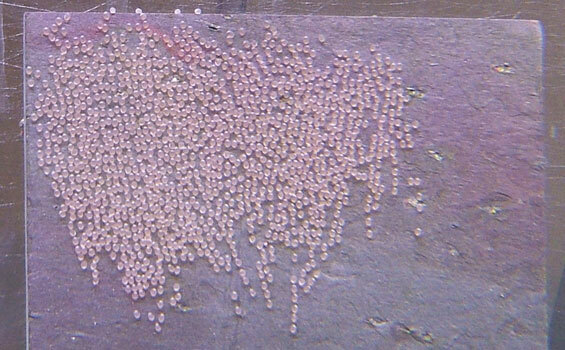 Hundreds of eggs or fry and no way to count them? 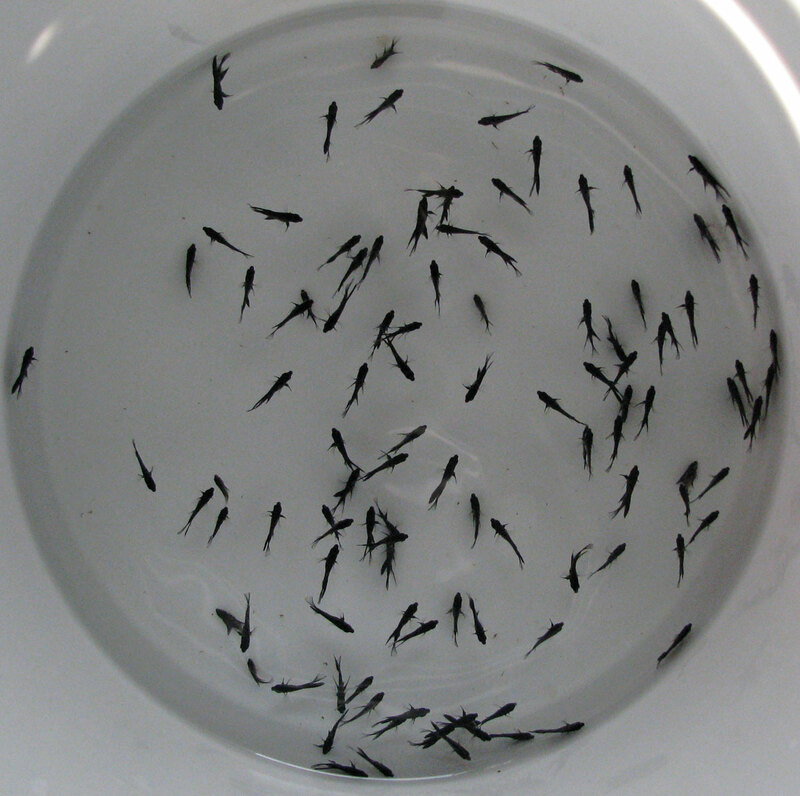 It happens to me all the time -- I'll need to count a mass of eggs or dozens of angelfish fry in an aquarium. Why? 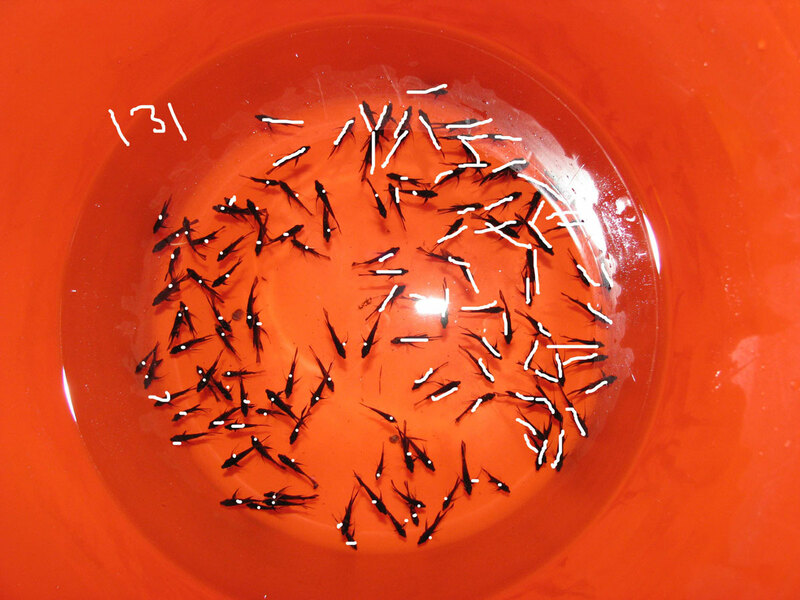 Because knowing the number of fish is important for determining bio-loading. If you have 500 fry in a 20 gallon tank, that might work when they are just free-swimming and maybe up to pea-size, but you will be in trouble when they get any larger. If you haven't counted them, you may think there's only 200. Also, if you know you have a borderline situation, you can do more frequent and larger water changes to compensate. Here's a picture I took of some angelfish eggs with my Fuji FinePix E550 6.3 Megapixel camera. 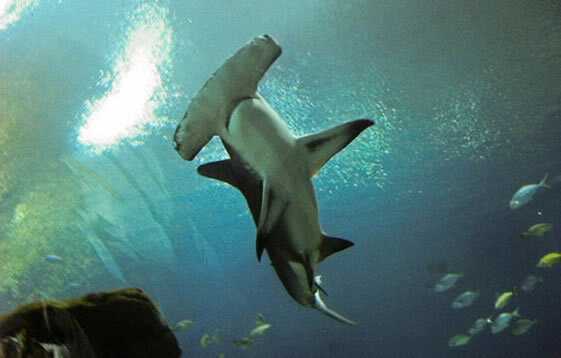 You will need to have the aquarium lights turned on and turn up the ISO on the camera to at least 400. The automatic mode may take care of that for you. A tripod helps with these pictures, too. Using the flash can be a problem and I don't recommend it. You may also need to turn on the macro mode if the eggs or fish are too close to the lens. The good thing about digital cameras is that you can take an infinite number of pictures until you get one that works. I took a few to get the above picture. Next, print the picture. A color printer probably helps a lot here. I have an OKI C5800Ldn color laser, but any cheaper inkjet printer should work fine. 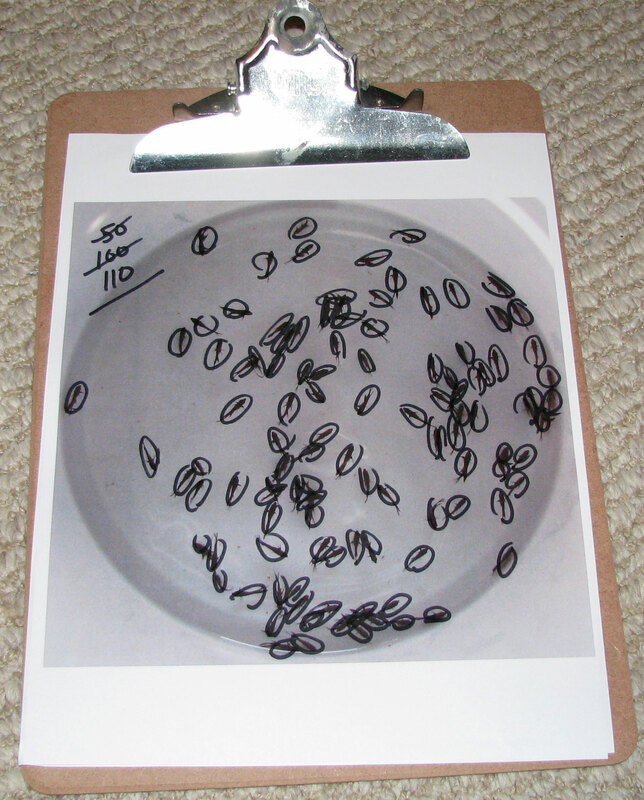 Clip the picture to a clipboard and grab a pen or small marker and circle each egg that you count and make notes every 50 or so in case you start to lose count. I don't have my page where I counted these, but there were 1270 eggs, plus or minus a couple. This spawn led to 750 good fry. 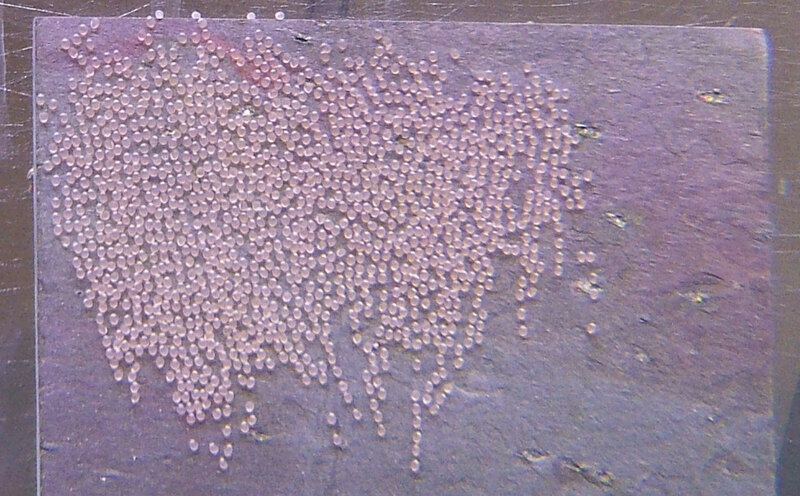 If you just looked at this clutch of eggs, you might think there are only a few hundred. If you don't have a printer or don't want to waste expensive ink or toner, you can also open the picture up in a program such as Photoshop or Paint and click a dot on each item you count to mark it as already counted. First, I'll print the page and then circle each fish as I count, writing the number down every 50 fish. So there were 110 fish. When you take the picture, take several until you feel you have one where the fish are fairly evenly distributed and there aren't a bunch of overlaps. This was a really good picture, so I would say the count is accurate to within 2 fish. Sometimes you have to take a guess if there's a group huddled together. You can see in the picture that I used two methods of marking the fish. 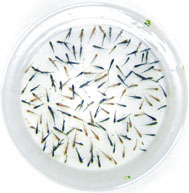 A line through the fish can help identify each fish in a cluster. Also, you can just use a dot which is quick and uncluttered. I only use this electronic method now when counting. Knowing good ways to count fish quickly can help prevent disasters in your hobby. If 500 fry are in a 10 gallon tank, it won't take long to reach the biological tipping point. Staying on top of the number of fish in an aquarium will save lives and help you raise healthier fish.